여자친구를 감동시키는 가장 좋은 방법은 뭐에요? = What is the best way to impress one’s girlfriend? 학생들이 그 내용을 중학교 때 이미 배웠잖아 = You should know that the students already learned that content in middle school! Notes: This word means both “technology” and “skill.” A lot of the times when a word has two difference meanings, their respective Hanja equivalents are different. 기술 is one word, that means both “technology” and “skill.” It doesn’t make sense to me either. The context can tell you what translation should be best. Notes: The word “음력” is used to refer to the lunar calendar (with is semi-followed in Korea, especially by the older generation), and “양력” technically refers to the solar calendar. The word “달력” is used to refer to the actual book of the calendar. 숟가락이 없는 사람이 있어요? = Is there anybody who doesn’t have a spoon? Notes: 땀 is often used with “나다” to indicate that sweat “comes out.” For more information on how/why this is done, see Lesson 14. Notes: The word “차이점” is often used with very little or no difference in meaning. You could translate “차이점” to “difference point,” but “difference” is often sufficient. Notes: This is often heard over the broadcasting messages of subways, buses, trains and airplanes in Korea. In these cases, it is often said as “승객 여러분” to be more polite. = This is Seoul Station. Riders wanting to take the Airport Railroad or the KTX, please transfer at this station. Notes: The word “회원님” is commonly used to be more polite, especially when workers refer to the members of their club. Notes: The Konglish word “사인” (sign/signature) is often used instead of 서명. Notice here that ~이/가 should be placed on the indication of time. 저는 삼성에서 일해요 = I work at 삼성. 그 말을 그만하세요! = Stop saying that! = I want to spend precious time like this with my mother next year too! Now, let’s build on what you learned and apply the ~는 것 principle in other ways. Before I even begin this lesson, I want to point out that I will be describing things that most Korean people can’t distinguish. When learning about subtle differences in a foreign language, it is often difficult to fully grasp because native speakers of that language can intuitively feel the difference, but not express it. I will do my best to describe this feeling, but keep in mind that most Korean people would probably have difficulty expressing what I will attempt to describe in this lesson. As you learned in the previous lesson (and as you can see in the two example sentences immediately above), you can attach ~ㄴ/은 to the stem of a verb to describe an upcoming noun in the past tense. 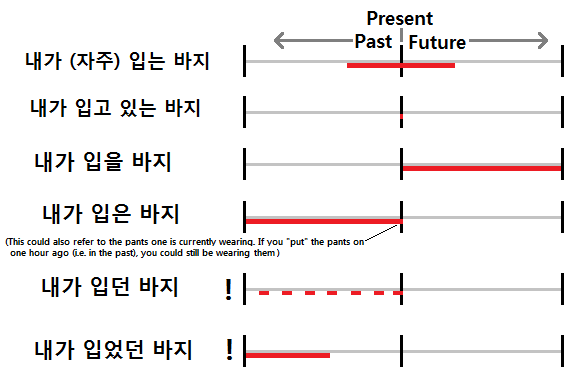 In addition to ~ㄴ/은, there are other ways that you can describe upcoming nouns in the past tense. The two additional ways to describe an upcoming noun in the past tense include the grammatical principle ~더~. Notice that there is a “~” both before and after the syllable “더.” I include ~ both before and after to “더” to indicate that not only is ~더~ attached to things, but things are also attached to it. ~더~ is a fairly advanced grammatical principle and has multiple applications. 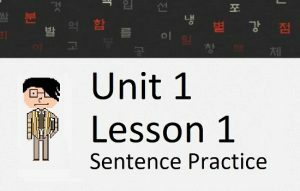 I discuss ~더~ and introduce the various ways that it can be used in the later lessons of Unit 5; where I introduce ~던가 (Lesson 117), ~더라 (Lesson 118) and ~더니 (Lesson 120). For now, I will concentrate on the nuance that ~더~ adds by showing you how it can be used to describe an upcoming noun. When you see ~더~ used as part of a grammatical principle, it signifies that the speaker is recalling/remembering some fact from the past that was experienced. ~더~ can be attached to the stem of a verb, and ~ㄴ/은 (the same ~ㄴ/은 that describes upcoming nouns in the past tense as learned in the previous lesson) can be attached to ~더~. I’m not going to make full sentences yet because I’m still in the process of explaining the subtle difference between various ways to describe a noun in the past tense. Once we get all the grammar under our belt, I’ll start making real sentences. Despite their similar (/identical) translations, there is a difference between the two constructions above. First of all, remember that the function of ~더~ is to indicate that the speaker is recalling/remembering some fact that was experienced. In the second example, the speaker is explicitly expressing that this thought is coming from memory – something that the person remembers doing or experiencing. The first example is just a simple fact, and this additional “memory” feeling isn’t present. This doesn’t mean that the first example above isn’t being “recalled/remembered,” it just isn’t being explicitly expressed. I realize that this sounds ambiguous. I’ve talked about this with Korean people for years. When I try to get Korean people to explain the image they have in their brain when hearing ~더~ (and specifically ~던 compared to ~ㄴ/은) they move their hands in a way that shows that something is popping or exploding out of their head. However, I would never translate that sentence this way. The “recalling” feeling of ~더~ in these cases is very subtle – more of a feeling – and unless the context indicates otherwise, the focus is most likely on the clothes than on the recollection. In addition to having this “memory from experience” feeling, the use of ~던 in the construction above indicates that an action occurred repeatedly in the past. I specifically chose the construction “내가 입던 옷” because it is an excellent example to describe this usage. The clothes that are being described are clothes that the speaker wore on multiple occasions (this makes sense, because they are clothes). When you say “내가 입은 옷,” again, you are just stating a simple fact, and there is no additional information regarding “memory” or if you wore the clothes once, or many times. All that is being stated is that – at some time in the past, you wore those clothes – and no additional information is given. ~ㄴ/은 is a very simply way to express that you wore these clothes in the past. In the first example, the act of “wearing” an article of clothing can happen repeatedly over time. Therefore, this construction is possible. In the second example, the act of “buying” an article of clothing does not happen repeatedly. Once you buy one piece of clothing, you don’t buy it again. Therefore, this construction would be unacceptable (or at the very least, very uncommon). In the second example, the act of “being born” cannot happen repeatedly. Therefore, I can’t imagine a situation where this would be appropriate. I realize that I just keep piling on the meanings hidden behind ~던, but there is another subtlety that you should be aware of. When ~던 is used, we know that the speaker is recalling something from memory, and that the action occurred repeatedly in the past. It is also possible that this “repeated” action is still reoccurring into the present (or whatever current time is being described in the sentence). Unless otherwise specified in other parts of the sentence, this repeated action hasn’t been stopped and is still re-occurring. The speaker is describing the clothes that he wore. There is no deep/hidden/subtle meaning to it. All we know is that at some point in the past, he wore the clothes. Did he wear it often/repeatedly? Did he wear it once? Does he still wear it? Has he stopped wearing it? The answer to all of these questions is ambiguous – and rightfully so. A lot of the time in conversation you don’t need to specifically describe the noun you are talking about. Simply saying “the clothes I wore” can be sufficient. In this English sentence (“the clothes I wore”) is equally ambiguous to the sentence above. The speaker is describing the clothes that he recalls/remembers wearing (as is the function of ~더~). The clothes being described were worn repeatedly in the past, and are likely still presently being worn – not necessarily at this moment, but “these days” (or at whatever time is being described in the sentence). There is no specific information about whether he stopped wearing the clothes – and unless otherwise stated, he probably still wears the clothes from time to time. The clothes haven’t “stopped” being worn – and they are still being worn “until now.” Of course, you won’t be wearing them after today because you’ll be throwing them out. In the examples above, the object is being described by some action that “I” did. I mentioned earlier that one of the subtleties of ~던 is the feeling of “remembering/recalling.” In the examples above, of course I am remembering them, because “I” am the person who performed the action. This subtle meaning of “remembering/recalling,” although present, seems irrelevant. Nonetheless, you should remember that ~더~ contains this meaning. I use the present tense “come” in the English translation above. You could argue than “came” or “used to come” would be more appropriate because we are describing the person as a customer who came in the past. However, because of the context of the sentence – they also “just came in” and are probably still there now – indicating that it could be used in the present tense. Again, it is difficult to translate these sentences in English. Pay more attention to the Korean sentence and use the English translation as a reference. These sentences could all be possible in English to describe ~던 in this case, but in my mind don’t accurately describe the subtleties that exist within ~던. To add to the confusion, there is another way to describe an upcoming noun that looks similar to ~던 and has a similar meaning. Let’s talk about this next. Alright, now it’s time to explain the difference between ~았/었던 and ~던 or ~ㄴ/은. The speaker is describing the clothes that he wore in the past. Because ~더~ is included within this, the speaker is describing the clothes that he recalls/remembers. The clothes being described were worn at some time in the past (this could be indicated elsewhere in the sentence), and are not pants that the speaker wears anymore. The meaning and feeling of ~았/었던 is similar to the meaning and feeling of ~ㄴ/은. Most Korean people would tell you at first glance that they are the same. I will do my best to distinguish them for you. As I mentioned before, when you say “내가 입은 옷,” you are stating a simple fact, and there is no additional information regarding “memory” or if you wore the clothes once, or many times, or if you still wear those clothes these days too. All that is being stated is that – at some time in the past, you wore those clothes – and no additional information is given. ~ㄴ/은 is a very simple way to express that you wore these clothes in the past. Saying “내가 입었던 옷” is similar, but the usage of ~더~ describes that the speaker is “remembering/recalling” this from memory/experience. Saying “내가 입었던 옷” is also specifically indicating that the action of “wearing the clothes” is finished and doesn’t happen anymore. It is possible that ~ㄴ/은 can be used to express this, but its meaning is more broad and doesn’t state this explicitly. Because the pants were worn (or put on) in the morning, it’s likely that you are still wearing these pants. This sentence does not explicitly state if you have taken them off or if you are still wearing them. ~ㄴ/은: Attached to a verb to describe a noun where the action occurred sometime in the past. There is no additional meaning given to it. All we know is that at some point in the past, the action happened. ~던: Attached to a verb to describe a noun where the action is recalled to have occurred repeatedly in the past, and is continually repeating to the present (or to the time described in the sentence). ~았/었던: Attached to a verb to describe a noun where the action is recalled to have occurred in the past, but has finished occurring and currently does not occur. I deliberately didn’t include English translations because using words to describe when the pants are worn in either language heavily depends on the context of the sentence. Also notice that I included an exclamation mark “!” for the last two to depict that there is a feeling that those actions are being recalled from experience. I think you might be comfortable with this now. Unfortunately, we need to discuss how ~던 and ~았/었던 can be added to adjectives. Although “예쁜” is indicating that the girl is currently pretty, we can infer that she also was pretty in the past. Most of the time, if a noun is described a certain way by an adjective in the present, the same could be true of that noun in the past. Earlier in the lesson you learned about adding ~았/었던 to verbs. ~았/었던 can also be added to adjectives, and it has a similar function as when used with verbs. 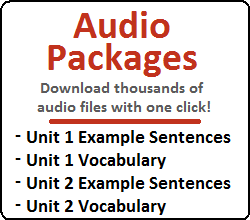 When used with a verb, the speaker is indicating that the action happened in the past, but has since finished and does not occur anymore. Up until now, I have been able to describe the subtle difference in nuance between ~ㄴ/은, ~던 and ~았/었던 when added to verbs. I have also been able to describe the subtle difference in nuance between ~ㄴ/은 and ~았/었던 when added to adjectives. Adding ~던 to an adjective is possible but is very confusing. I had a lengthy discussion with a Korean grammar teacher recently. After writing everything you see above (i.e. this whole lesson until now) I discussed every point with her to hear her opinion about my observations. We discussed the differences between ~ㄴ/은, ~던 and ~았/었던 when added to verbs. We then talked about ~ㄴ/은 and ~았/었던 when added to adjectives. Remember, this conversation happened between a Korean person who, as her profession, teaches Korean language to Korean high school students and a dude from Canada. Notice that ~던 is added directly to two adjectives in the short lyrics above. It is attached to 푸르다 in the first line and to 외롭다 in the third line. The first word, 소중하다 has ~았/었던 attached. After she heard my amazing singing, she realized she was wrong. She then thought about it more and said that adding ~던 to an adjective has the same meaning as when adding ~았/었던, but the latter would be much more common. I figured that explanation was nonsense. There is no way that ~았/었던 and ~던 could have identical meaning. The only reason why I’m sharing this story with you is so you can realize that even Korean people, including those you would call “experts” in their own language, have a hard time distinguishing these things. 시끄럽던 교실 – This construction is possible. Although the “repeated” function of ~던 can’t really be applied, the function of indicating that something occurs to the present tense can be applied. If you said “시끄럽던 교실” to a Korean person, they would assume that the classroom was loud up until the present, but it just stopped being loud. If we compare this to “시끄러웠던 교실,” Korean people would say that the classroom was loud further in the past, and there is a gap between when it stopped being loud until the present. This could explain why a construction like “예쁘던 여자” would be unnatural. It’s not really possible for you to recognize that a girl was pretty in the past, and notice that this continues all the way until present and for her to all of a sudden not be pretty anymore. However, it could be possible (however unfortunate) for a girl to have been pretty in the past, and for some time to pass, and then (presumably during that time period) for the girl to stop being pretty. Was the sky clear until the present and then became dark? Was the sky clear sometime in the past and then became dark sometime in the past? Was the sky clear sometime in the past and then became dark in the present? Was the sky clear every day (habitually) before becoming dark? Will the sky become clear again after becoming dark? That’s as far as I’m going to go. 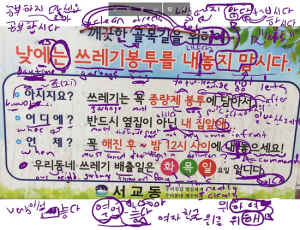 As I said at the beginning of this lesson – the difference between ~던 and ~았/었던 (compared with other grammatical principles that you learned in the previous lesson) is very confusing. If you have reached this point and think to yourself “I am still a little bit unclear of the difference” – Congratulations! You’re just like a typical Korean person. As I have discussed, Korean people – including those who you would consider “experts” in their own language – can’t describe the difference precisely. I hope that you have enjoyed my discussion about these, and I hope that you are able to distinguish them a little bit. 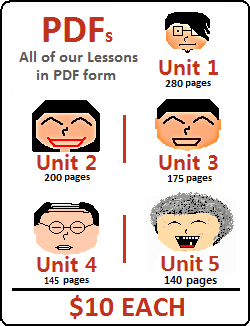 Above all, I hope that this lesson hasn’t completely turned you off of Korean forever!